This Chennai brand startup is one of the best gifting/home décor stores we’ve covered in the city, and we think you should check it out. Here’s why. 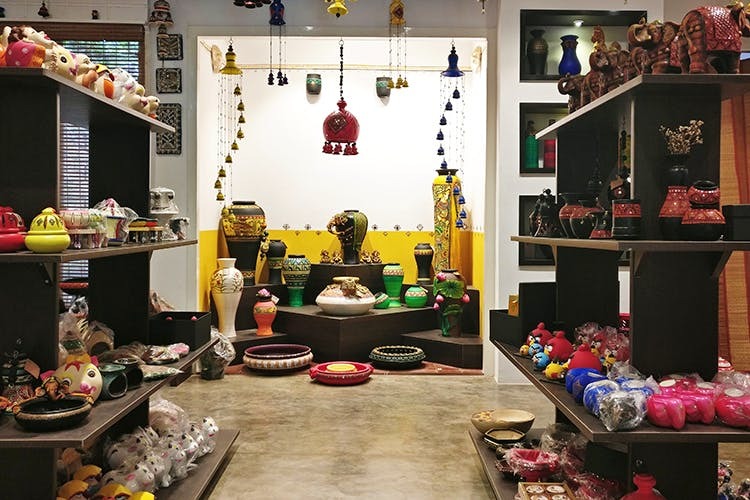 Just Light – The Light Up Store is a home décor/gifting/wedding store situated in Karpagam Gardens, Adyar. Initially, into just Terracotta ware, Just Light has expanded greatly in the last year and now has a whole manner of curios and knick-knacks. We went to check out their eight-month-old storefront to learn more. The studio is cosy, a well-lit space that’s been filled from top to bottom with their products. Their collection of home décor and curios ranges from terracotta art to ceramic ware to paper craft to cute light fixtures and even decoupage glass bottles. What was striking were the swathes of colour throughout their studio, all their pieces have vibrant artwork and rich colours that really make them stand out. Curious to find the best buys we enquired about their most popular products. For gifting, we were surprised to find Ganesha figurines topped the list (we found a really cool key holder style Ganesha! ), followed closely by their intricately designed Terracotta elephants. Beyond that, a few notable highlights we found in our search were their beautiful ceramic beer mugs, Peruvian adapted terracotta water bottles and terracotta pots. Beyond all of their attractive products you’ll find in their store, we were most blown away by their box making. Almost all products bought at their store can be bought and gifted in attractive and neatly designed paper/cardboard boxes. The focus on form and effort put into detail are truly staggering and each box can be custom made to the product being gifted. They’re so popular for their box making, that they’ve received orders of up to 8000 boxes from private contracts! Their products from their elegant boxes to their intricate artwork is made in-house, solely by employing and training artisans from weaker socio-economic backgrounds. That focus on being conscientious citizens while also creating quality goods for the commercial market is what makes them stand out. Price wise you can find products starting from around INR 100 and the best part is that they sell their boxes separately too, so if you’re looking for classy gifting/packing solutions for any event you should check out this store. In fact, we recommend this store for any gifting needs you may have, it’s really that good.